The last article certainly did cause some interest and I want to thank all those people who where kind enoughto supply information. Various information came to light and here we will just tie up all the loose ends. Walt Hickerson from Tulsa is a collector who specialises in Goble baits and was kind enough to get me a copy of the paper work that came with a bait. This piece of paper belongs to Louie Tate who acquired it from a guy called Kent Clarke also known as Superman by some. He found it at a garage sale in the early 1970’s. 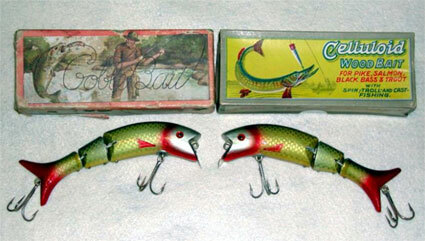 It was in a boxed set of Goble baits all mint and unused, he left the baits and bought the paper for $1. No one has ever seen the boxed set of baits or knows what happened to them. 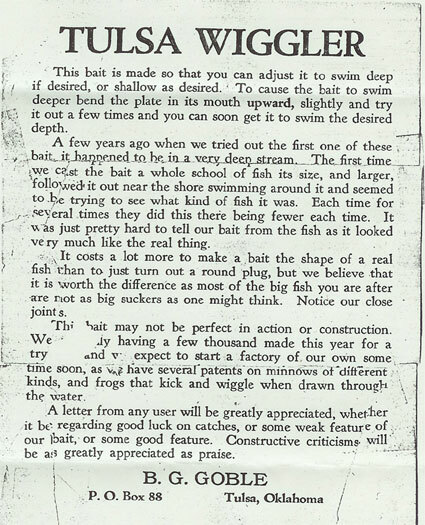 As you can see the bait was actually called the Tulsa Wiggler and B. G Goble had a few thousand of the baits made. His intention was to start making the baits in his own factory along with his patent minnow. The thoughts are that he never got the factory running and went back to his oil field supply company. Walt Hickerson's collection of Tulsa baits. 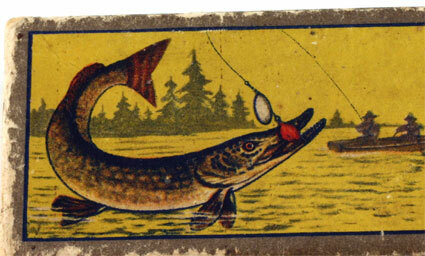 Access to a DAM catalogue circa 1933 finally cleared up the mystery of who made the Vampir baits. The original DAM Vampire baits were made by Heddon and imported into Germany by them. 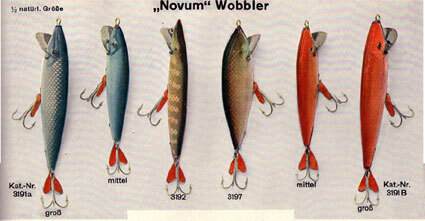 Novum Wobblers from the DAM 1933 catalogue showing their own baits. 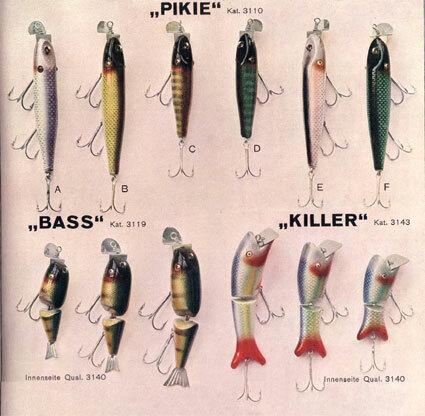 Pikie Bass and Killer baits from the 1933 DAM catalogue. 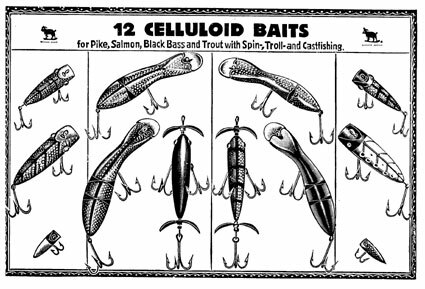 Heddon had patented and introduced them as the Gamefisher in 1923 but it was not until the early 1930’s that DAM started to import them into Europe. DAM quickly introduced them to Europe, copied them, came out with an improved bait and considerably expanded the range of baits offered. 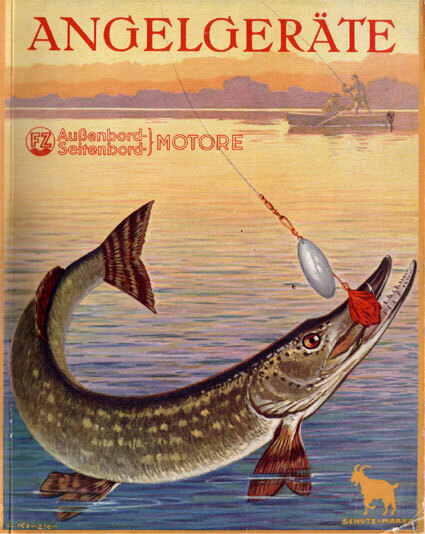 This expansion came in the early 1930’s after Otto Kuntze had perfected the making of the baits. Otto Kuntze had originally joined DAM in 1910 providing additional resources to Oscar and Fritz Ziegenspeck the original founders of the company. His improvement was in the coating that was applied to the basic Heddon bait. The German language catalogue calls the bait the D.A.M Wobbler (Holz=Zelluloid=Spinner) which translates as “Wooden Celluloid Spinner”. We also see the American retailed DAM bait, the Celluloid Wooden bait, and I have been asked were some made of celluloid. The answer is no. What DAM had done was to cover the bait with a celluloid finish rather than the standard wood varnish. With the help of some very experienced chemists he came up with his new covering. I suspect that it was similar to those celluloid’s used by Percy Wadham. After all DAM did retail the Wadham baits in various European countries. Celluloid Bait sample box of 6 baits. They also made slight adjustments to the positioning of the treble hooks to give a better performing lure with greater durability. DAM claimed to be the only European maker of such baits and that others who claimed to make these baits were actually selling DAM made baits. One picture that I omitted from the last article is the one showing the similarity of art work on the Ever Ready box and the Celluloid box. Artwork on the Celluloid box. Artwork on the Ever Ready box. Front cover of the DAM 1936 Catalogue. I have also included the illustrations from the 1933 DAM catalogue. 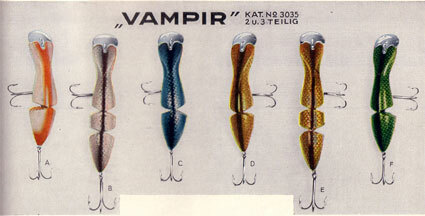 The first Vampir baits were made by Heddon and imported into Germany. 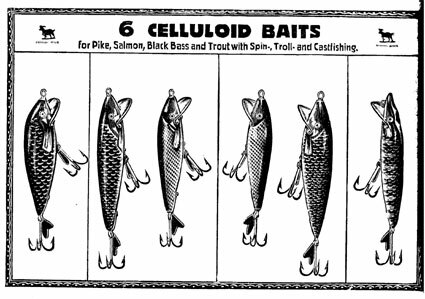 In 1933 Otto Kuntze had perfected his own version of this bait and sold it through his own European distribution network. DAM imported the Wigglefish from Creek Chub and then made their own bait in three different sizes unlike the single size Creek Chub Wigglefish. These baits were called Bass. DAM made baits for Gobble who sold and marketed them in the USA. These baits were the two and three section Tulsa Wiggler that DAM sold through their own distribution network as Killers. All the companies were aware of each others products with co-operation taking place initially between them. I suspect that after a while the American companies thought that as the DAM company offered no real threat they just let them get on with it. 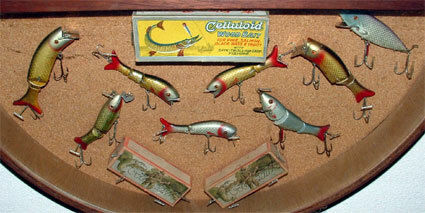 Clyde Harbin sent me a series of photographs of baits that he had located in the Heddon factory some years ago. It is interesting that the Wigglefish is almost certainly a DAM manufactured bait. He also seen me various Heddon Game Fishers and Vampir baits again from the Heddon factory. Why would they have them? Almost certainly checking up on what DAM was producing and keeping informed about what was going on in the world. This entry was posted in Creek Chub, D.A.M German tackle maker, Ever Ready German tackle maker., Gobel Bait.. Bookmark the permalink. First, thanks for all the hard work that went into compiling this information. Here’s the question I’ve never been able to get answered, If the original Game Fisher/Vampir baits were made by Heddon & exported to germany, why are the hook hangers different than standard L-rig? Why would similar hardware be produced to serve the same purpose as existing (on hand) hardware? This was always the reason why I’ve felt Heddon didn’t make Vampir baits. Darn, does this mean that now I’ve got to acquire a bunch of Vampirs to add to my collection, I sold all mine to Ron Hanley. I have a Gamefisher collection and am very interested in acquiring a Dam Vampir. Mint condition is not a requirement. If you have one or know someone who has one for sale, please contact me.